The fez cap originated in the Moroccan city of the same name. Its distinctive red color came from a dye made from crimson berries. Initially a symbol of Ottoman modernity, the fez over time came to be seen as part of an "Oriental" cultural identity. Seen as exotic and romantic in the west, it enjoyed a vogue as part of men's luxury smoking outfit in the United States and the United Kingdom in the decades surrounding the turn of the 20th century. Many fraternal societies adopted the fez as their official headgear. In the Laurel and Hardy film Sons of the Desert members of the fictional organization of the same name wear the fez, and consequently so do those of the Laurel and Hardy International Appreciation Society, which is itself named after and modeled on the one seen in the film. 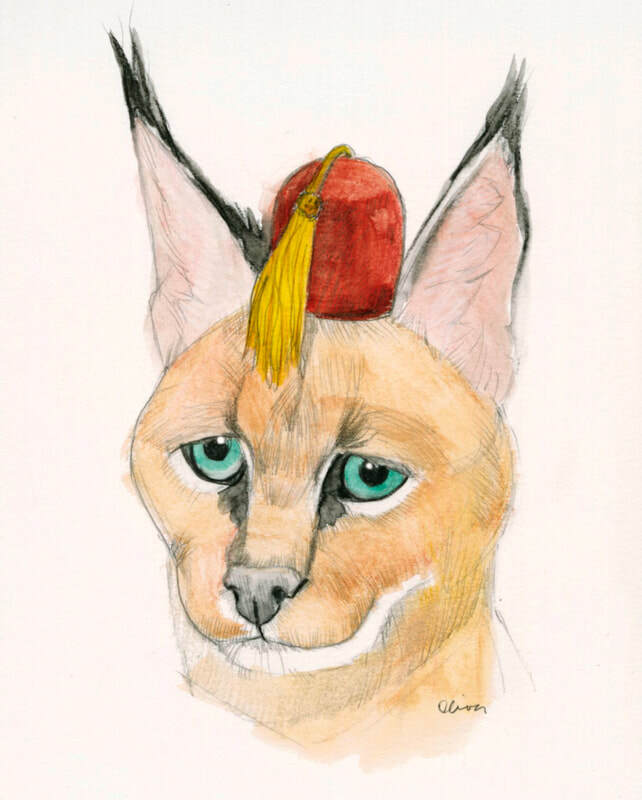 The caracal cat is also a native of northern Africa, and the fez seems a natural stylistic addition to his wardrobe. 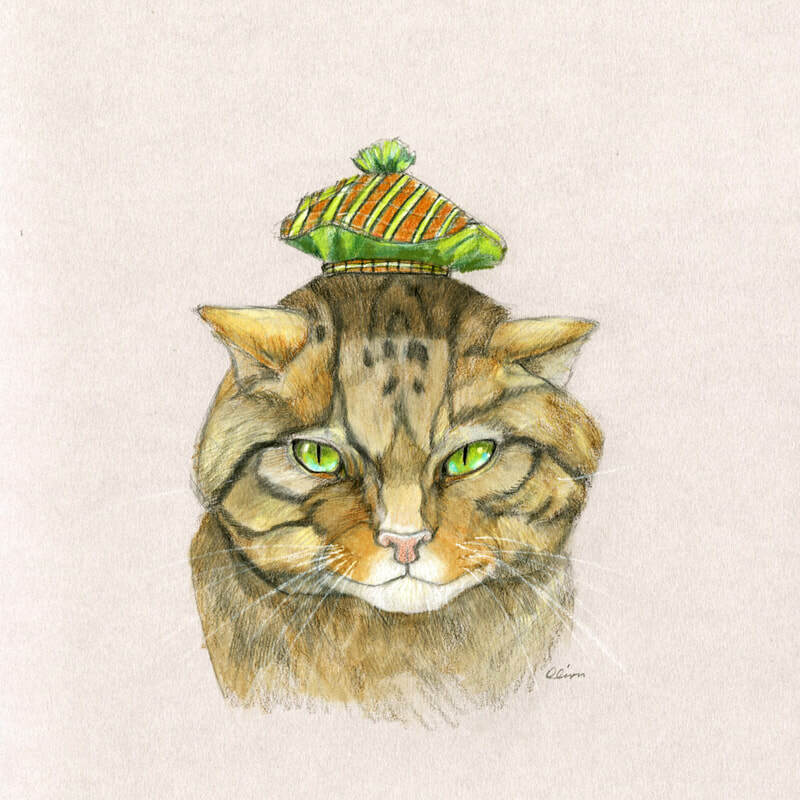 The Scottish wildcat, sometimes called the Highlands tiger, is a diminishing breed and is the only wild feline on the island of Great Britain. There may be only one hundred wildcats left. The main reason it is disappearing as a distinct species is because of hybridization with the native domestic cat populations. It is often quite difficult to tell a wildcat from either a tame or feral cat from looks alone. Just don't try to pet one: Scottish wildcats are well documented for biting clean through gauntlets and hands. Perhaps if they started wearing the tam-o-shanter cap, it would be easier to identify them. "Today's bellhop should be quick-witted, outgoing, and must like people." 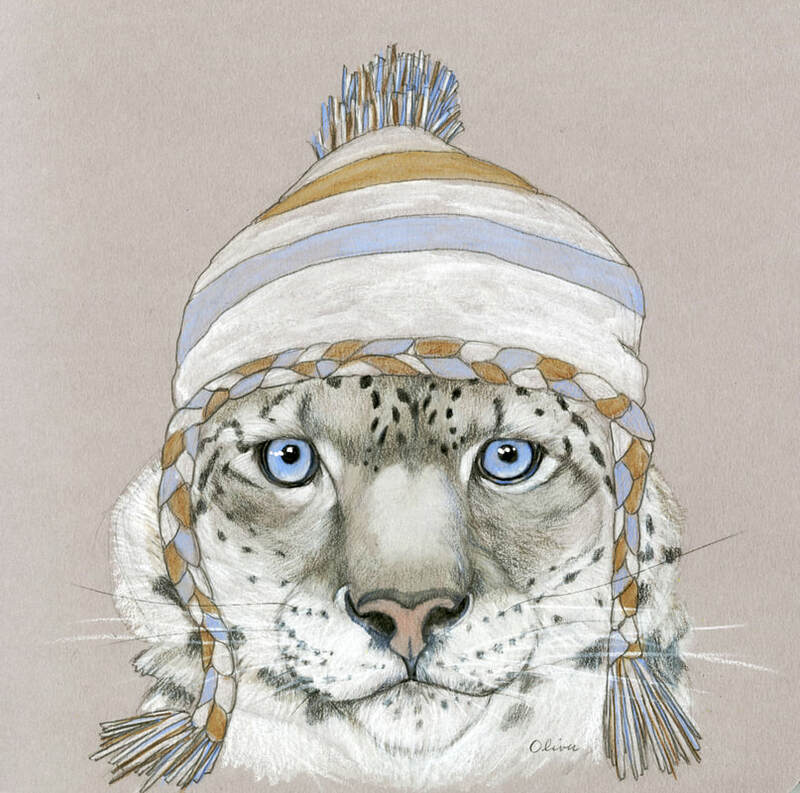 The snow leopard is very well adapted to living in cold, mountainous regions such as the Himalayas. But this one is smart enough to know that wearing a sherpa cap minimizes heat loss from the brain. 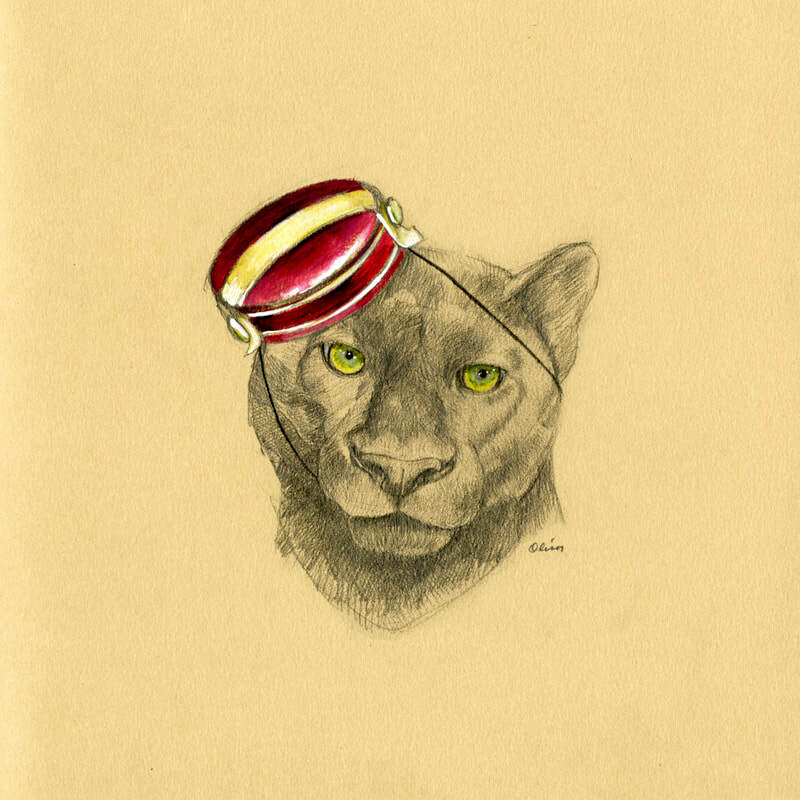 veryone knows that cheetahs have no need for shoes, but a hat is a different story. Here we see the fastest cat on earth wearing a shoe for a hat, with aplomb. The high-heeled Elsa Schiaparelli shoe hat was created in 1937 in collaboration with Salvador Dalí. The idea came from a photograph taken in 1933 by Dali's wife Gala, showing the artist wearing a woman's shoe on his head. 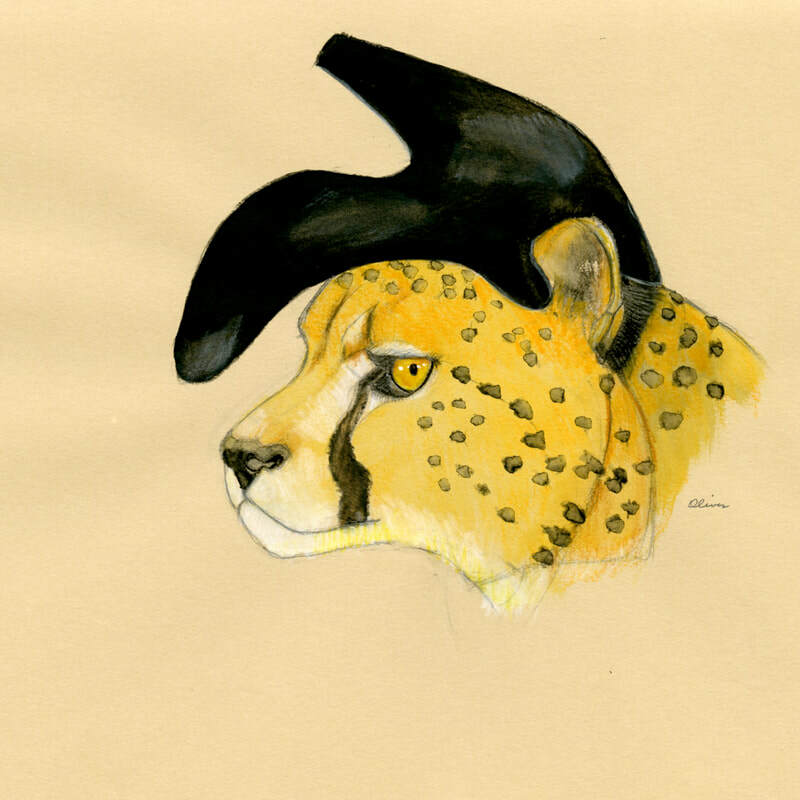 There is a whole bunch of Freudian theorizing about how a shoe (worn on the head) manifests some sort of phallic folderol, but the cheetah, being a stylish cat, just likes the way it looks. The pith helmet was first worn by Spanish forces when colonizing the Spanish East Indies in the early 1800s. It was later worn by the French in Indochina, primarily because of how well it protected against the damp and humid weather. It gets its name from the material of which it's made: the spongy, soft tissue found inside the trunk of the Indian Sola tree. It was also in wide use by colonizers who wished to establish a foothold in India and Africa. During the Anglo – Zulu war, British soldiers found that the white cloth covering of their helmets made them rather conspicuous targets so they started staining them with tea, which explains the khaki color of all modern pith helmets. By the 1930s, civilians began wearing pith helmets, particularly big game hunters who ventured into the subcontinent on safari, armed to the teeth and looking for animal trophies. 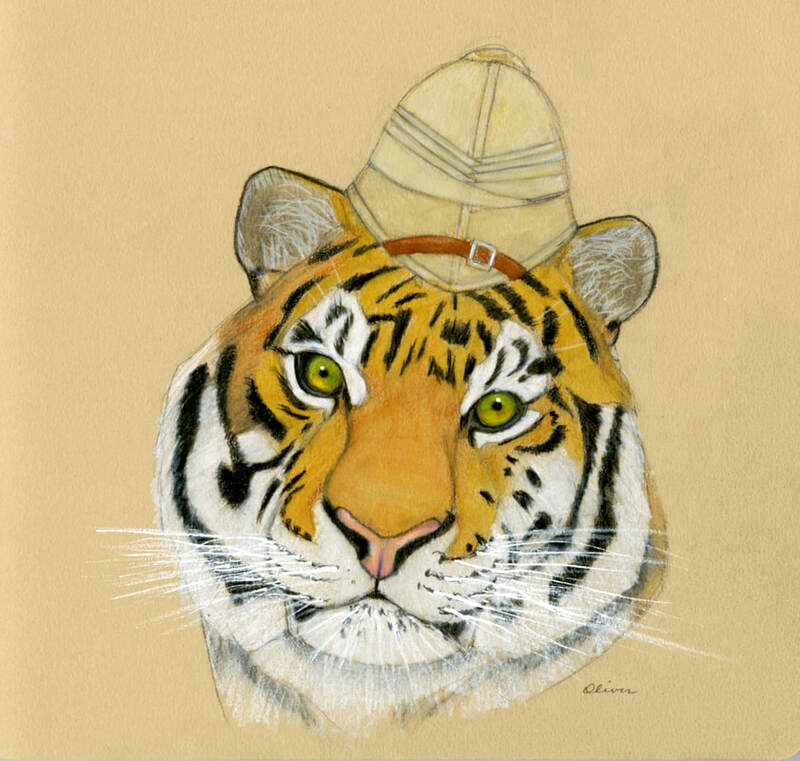 I like to think there were one or two tigers who thought the pith helmets looked ridiculous on humans and adopted the style for themselves. After dispatching the wearer, of course. The bowler hat--also known as a billycock, bob hat, bombín, or derby--is said to have been designed in 1849 by the London hat-makers Thomas and William Bowler to fulfill an order placed by the company James Lock & Co. which had been commissioned to design a close-fitting, low-crowned hat to protect gamekeepers from low-hanging branches while on horseback at Holkham Hall. 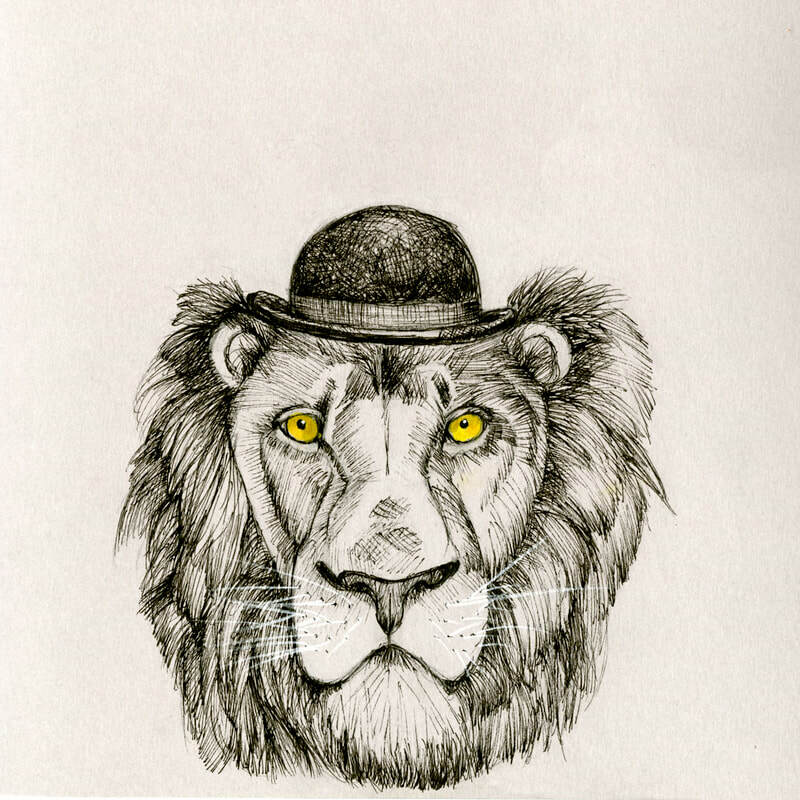 The keepers had previously worn top hats, which were knocked off easily and damaged. The bowler was the most popular hat in the American West. Both cowboys and railroad workers preferred the hat because it would not blow off easily in strong wind while riding a horse, or when sticking one's head out the window of a speeding train. It was worn by both lawmen and outlaws, including Bat Masterson, Butch Cassidy, Black Bart, and Billy the Kid. In the United States the hat came to be known commonly as the derby, and a restaurant in Los Angeles is both named for and shaped like a Brown Derby. The bowler is also famous in both art and film: one of René Magritte's most famous paintings features a man wearing a bowler; his face obscured by a green apple. Charlie Chaplin, Laurel and Hardy, Patrick MacNee, John Cleese, and Malcolm McDowell all wore bowlers. The King of the Jungle is in good company. Vermeer's 1665 Girl with a Pearl Earring is an early example of the turban in women's dress. But its popularity rose later during the Regency period in Great Britain, from around 1811 to 1820. The fashion was inspired by increased trade with India for cottons, and probably also by interest in the Ottoman Empire and Turkey. The turban has remained popular, and useful, especially on bad hair days, something Gypsy here wouldn't know anything about. 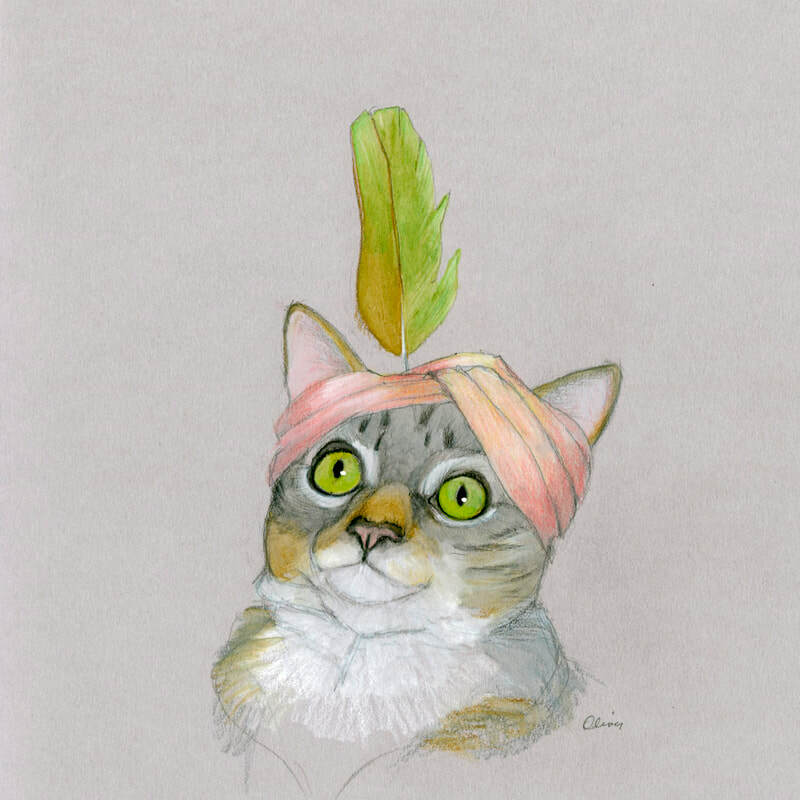 She just likes how the turban makes her look très chic. 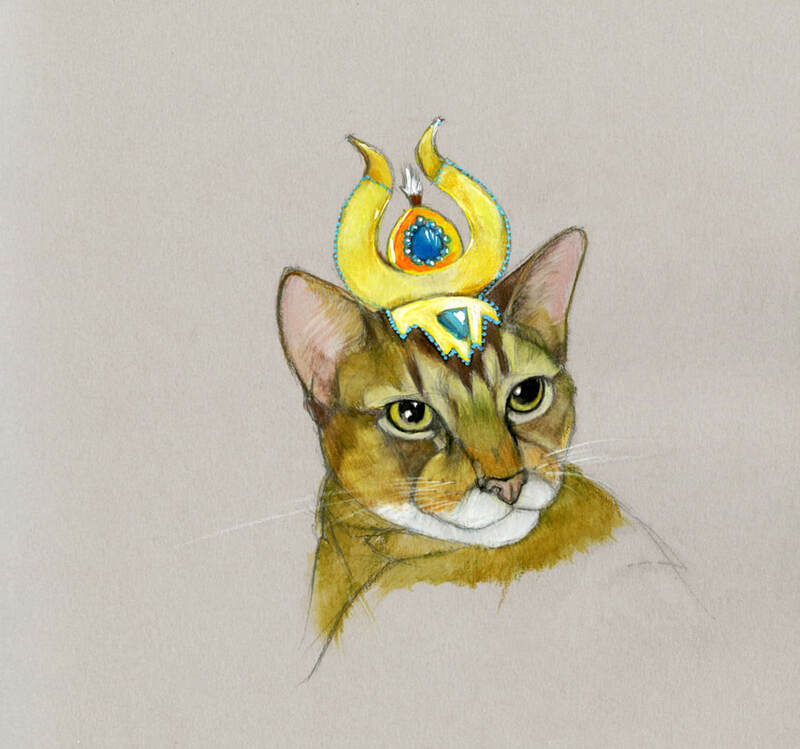 Silmaril, the Abyssinian, wears an Egyptian headdress. These cats are the oldest breed, which some say hail from the Pharoahs. Others say they came from the India coast area. 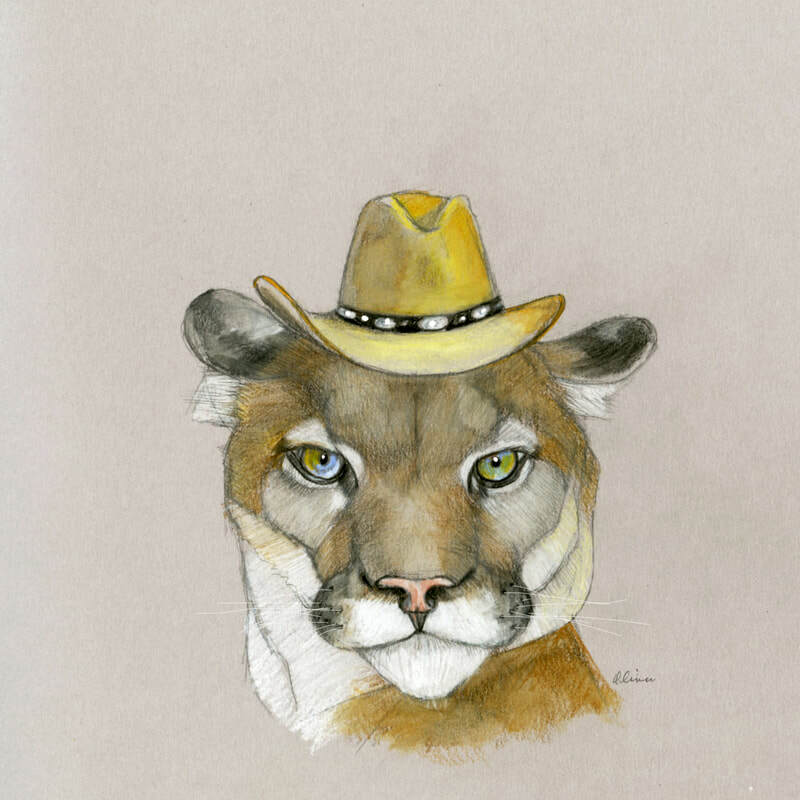 Either way, this is one hep cat.